Within KfW Group, KfW IPEX-Bank is responsible for international project and export finance. By providing tailored financing the specialist bank supports German and European exporters in global markets - all the while ensuring economic strength, growth and employment in both Germany and Europe. KfW IPEX-Bank can look back on a successful financial year 2018. Despite economic and political challenges in some regions of the world, high market liquidity and the constant pressure on banks and institutional investors to invest, KfW IPEX-Bank was able to fulfil its legal mandate to support German and European exporters in global markets. 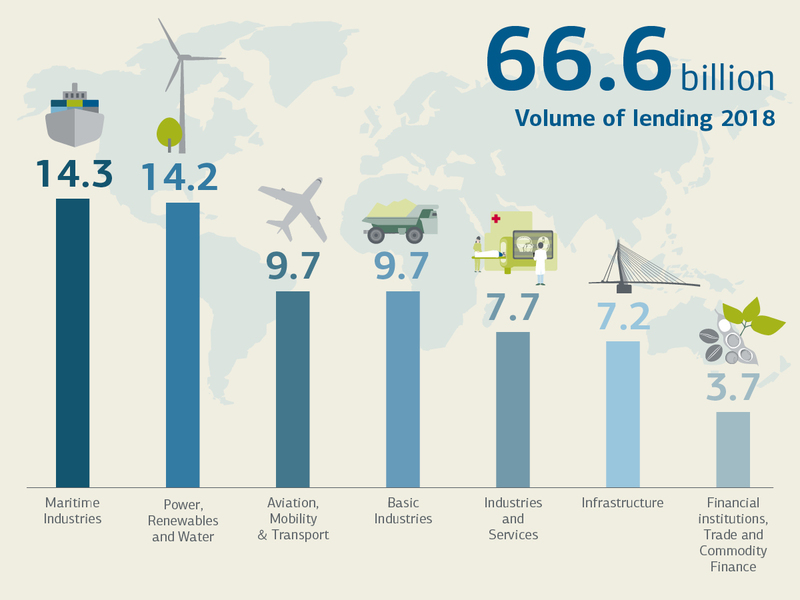 The volume of lending in the Export and Project Finance business sector increased to EUR 66.6 billion as of 31 December 2018 (2017: EUR 61.9 billion). The figures in tables were calculated exactly and added up. Figures may not sum to totals because of independent rounding. More detailed information is provided in our Management Report & Financial Statements. For personnel key figures for the financial year 2018 go to Human Resources.